In need of a caster for your robot project? A good caster can be a hard thing to find. I remember at times searching high and low only to end up settling for something I found at Wal-Mart. Look no further! 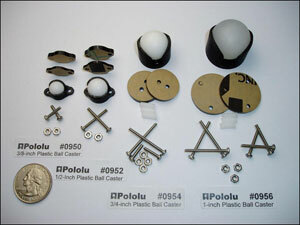 Pololu has produced a line of omnidirectional casters that should fill this void in your robotic parts collection. Each caster comes with hardware and spacers different mounting options. Choose from 3/8″, 1/2″, 3/4″, and 1″ diameter varieties. Check out our entire line of casters!